Using contactless cards instead of an Oyster to pay your travel fare has been possible on London buses for almost two years. From today, contactless card and NFC payments will also work on the capital's Tube, Overground, DLR and Tramlink networks, as well as on some rail services. For many commuters and regular visitors to The Smoke, using the iconic Oyster card has likely become a habit, and one you're not too bothered about breaking. While the Oyster will continue to be an easy way to get around, there are now several other options to consider. Join us as we explore the new ways to pay -- you never know, you might find one of them that little bit more convenient. No doubt you've used your credit or debit card to pay for the odd small transaction without entering a PIN code. That's thanks to the RFID chip hidden inside, and just like tapping on the petrol station card reader, you can now do exactly the same at station barriers. It's as simple as that: The gate reads the card just like it would an Oyster. The same daily fare caps are in place (this varies on the number of zones you've passed through) and for the new methods of contactless payment, there's also a weekly cap that calculates the best fare based on your activity from Monday to Sunday. People have been eager to give it a go, as Transport for London (TfL) reported more than 1,605 contactless cards were used at barriers before 8am on launch day. One of the best things about using a bank card is that you never have to top up, but as MayorWatch explains, there are other benefits to using this method. Oyster charges are calculated at the gate level, and if you forget to tap in and out of a station (particularly where there are no obvious barriers), you can be billed for a maximum fare of up to £8.60 that doesn't factor into the daily cap. 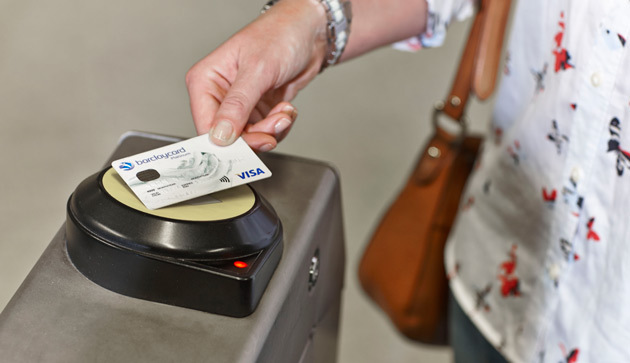 Contactless cards are treated a little differently, however, as they're charged only once at the end of the day, and the best fare is calculated by a back-end system, not by the barriers. If you haven't tapped in and out correctly, then TfL will attempt to fill in the gaps using your previous travel history and a bit of a guesswork based on where you could've gone wrong. Hopefully this'll mean less maximum fares for you and less refund processing for TfL. While you can now keep track of how much travel is costing you from your bank statements, you can also register your card to a TfL account, or add one to an account you already use to manage your Oyster. It'll keep a record of your journeys from the past 12 months, and let you request a refund directly if you think you've been wrongly overcharged. "Card clash" may well be the reason for a higher-than-expected fare, and TfL has been careful to highlight the danger. If you have a wallet full of debit and credit cards (and possibly even an Oyster), then it's best not to try and tap in with it. Not only does this avoid the potential embarrassment of walking straight into the barriers because the gate doesn't know which card to charge, but the worst-case scenario is that it picks up different cards each time. If you'd rather not pay a maximum fare on three different cards during the day, then be sure to always use the same card and not gamble with a wallet full of them. Alongside contactless cards, NFC payments are also now supported on the Tube et al after its recent introduction on London buses. Right now, though, there's only one mobile wallet in the UK that currently works with the NFC chip inside phones. That's EE's Cash on Tap app, but you have to be one of the network's customers use of it, and have a compatible handset, of which there are only a handful currently. Cash on Tap is more of an Oyster replacement, as you still need to top-up your account when you've depleted the available funds. Still, you won't need to queue up at a station as that's done from within the app, and you can also set it to add money from saved cards automatically when your virtual wallet's running low. 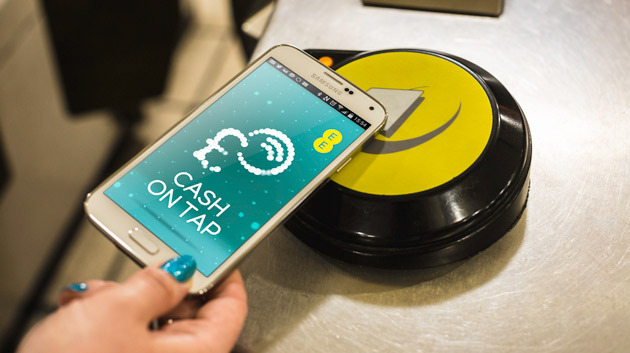 NFC payments are also covered by the new weekly fare cap, not that many of you will be using the smartphone option right away, given it's only available to EE customers with a supported device. We expect that others might be able to get in on the action eventually, but that requires the launch of more mobile wallet options. There's a chance other networks could follow suit, though carrier-agnostic solutions like Google Wallet would be preferable (not that we're sure the search specialist will ever release its app in the UK). Apple Pay has the potential to the resolve the issue for iPhone 6 and 6 Plus owners, but we've no idea when that will be available over here. Any mobile wallet is also at the whim of companies drafted in to process the transactions, so it's not as simple as just building an app. 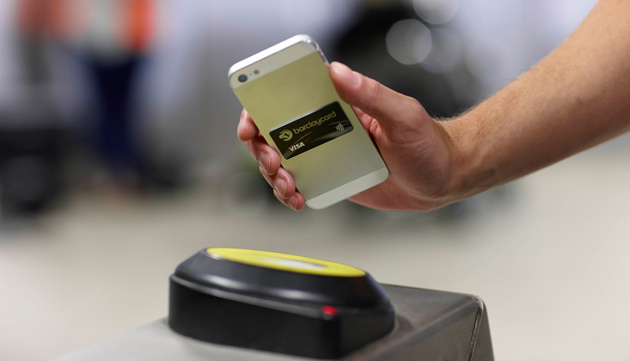 There are a couple of other ways to pay for travel by NFC sans smartphone, however, as Barclays has been enthusiastic about the technology for some time. The bank's PayTag NFC sticker, which you can attach to your phone (or anywhere else that takes your fancy), behaves much like a contactless card. It's only available to Barclaycard customers, mind, as it's tied directly to their account. That means you don't have top it up like you do with Cash on Tap, making it a pretty convenient option if you're still rocking old cards with no contactless support. 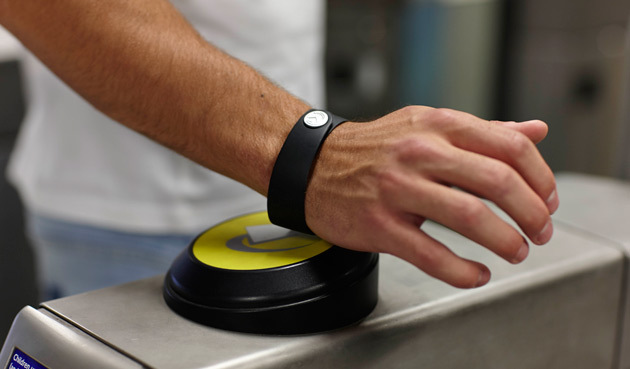 Barclays has also announced it's releasing a fresh batch of bPay bands that can get you through Tube barriers or onto the top deck of the bus. The wrist-worn wearable includes an NFC chip, and works like a mobile wallet, in that you replenish funds using an online account. Any Visa or Mastercard can be used to top it up, too, so it's not exclusive to Barclays customers. It's been trialled at numerous events and festivals before now, and the bank is giving away another 10,000 on a first-come, first-served basis to celebrate its compatibility with much of London's transport network. You can register your interest here, and if successful, you'll receive a free bPay band sometime during September. Barclays told us the plan is for a wider launch of the wearable early next year, but there's no word on how much it might cost those who didn't get in on the promotional roll-out.